A world that celebrates success doesn't see value in broken things. But God brings beauty out of brokenness. For a plant to rise from the soil the seed must be broken. For a baby chick to experience larger life the shell must be broken. Even a thoroughbred horse must be broken; it must learn to respond to the tug of the rein and the sound of the master's voice. Getting the idea? After a humbling encounter with Christ on the Damascus Road, Paul re-evaluated all the religious activity he once boasted about and called it 'dung' (Philippians 3:8 KJV). And you don't brag about dung, you're repulsed by it. Brokenness is the work of God by which He strips us of self-sufficiency so that the character of Christ may shine through us. Now don't misunderstand; being broken doesn't necessarily mean experiencing some tragedy. Many people suffer tragedy without drawing closer to God or even acknowledging Him. Indeed, the same sunshine that melts the butter hardens the clay. The issue in brokenness is not so much our circumstances, but our response. What is God trying to teach us? True brokenness is when He strips us of self-sufficiency to the extent that we've no strength left to fix ourselves. When God blocks every exit we try to take and we come to see that He alone is our answer, we make a life changing discovery. 'And what's that?' you ask. When God is all you have - God is all you need! Bottom line: God's power is reserved for those who have given up trying to do it in their own strength or to accomplish it for their own ends! We all need scrap paper. Grocery lists, notes at the phone, a million things. Why buy paper specifically for that? Save all the misprints from your computer printer, then do a magical thing...turn them over! One side is still perfectly good! Cut it into strips and put aside for notes! I have a stack next to me now that were fliers for church that were outdated. I could not possibly create the beautiful graphics God let's me be part of without scrap paper! 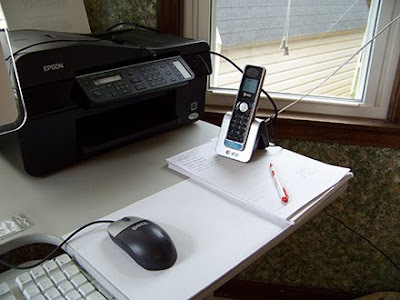 I also use it to print anything on the printer that doesn't HAVE to be on a clean sheet. You've already paid for it - use it again before it adds to a land fill! The total cost was $0 and time spent was about 0 minutes - no running out to the store to buy some! And how is this inspirational? We are to be good stewards of all God gives us! This is not only saving money, but recycling! Praise the Lord in ALL THINGS! If you'd like more of these, let me know and have a super day! And speaking of papers, today I'm giving you a happy background paper warm as the summer sun! If you download, please leave me a comment at the bottom of this post as I have disabled 4shared comments. This helps me to know what you like for the future. God bless you! Link expired. Available now in my PayPal store. E-mail me if you don't find it. Love the foil, thank you! These look interesting -- I'm excited to try them out. Thanks much for sharing! Thank you so much Lynette - this foil is wonderful. Thank you so much for this Freebie. I want to let you know that I posted a link to your blog in Creative Busy Hands Scrapbook Freebies Search List, under the Elements or Papers post on Aug. 07, 2009. Thanks again. Thank you for sharing so many AWESOME goodies! :) Have a GREAT day! 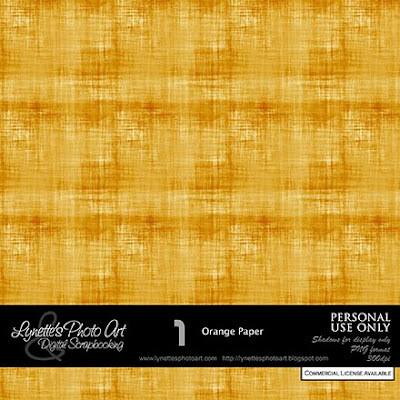 Hi Lynette, thank you so much for this lovely bright sunny paper. I love the texture you have used. Thank you so much for sharing this lovely textured paper.